If you are interested in how to do wall painting designs yourself, you need to start with simple interior house painting techniques. Painting can be complicated for some but not when enough practice is in place and when you know what to do. We cannot actually help you out with practice but we can give you some really simple interior house painting tips that will make your projects look a lot better. A lap mark is that really ugly stripe that appears due to uneven paint buildup layers. These happen as you are rolling over paint that is partly dry. This is particularly possible with latex paint used in dry, warm conditions. In such a scenario, paint starts stiffening in under 1 minute. If you want to avoid the lap marks (you surely want to), the trick is maintaining a wet edge. Every single roller stroke will overlap before paint dries. To get that wet edge, start from a corner and then run your roller all the way up and down the wall’s full height. Move over just slightly with every single stroke. If you see uneven thick spots or there are runs that appear, simply move backward. Your roller should never be dry so keep reloading it. The main reason why wall paint color ends up being uneven as you paint your room is that paint color can vary from a bucket to the next. This is why you have to calculate how much paint is needed. Then, you want to mix paint cans in a larger bucket. Mixing paints allows you to get that consistent color you are interested in. In the event that you cannot estimate how much paint you need, just add more instead of risking ending up with less. Leftovers can be put back into your cans. We do hope you use tape to cover corners and areas that you do not want to paint over. This is necessary but it also creates a problem. Paint will form a film between tape and wall. You cannot remove that paint until the paint is dry. At the same time, if you just pull off tape, tear pieces appear. A simple solution for this is to just cut the tape loose before you pull it off. This can be done with a simple box cutter knife or a sharp utility knife. Whenever painting rooms, professionals follow a strict order. The trim is first painted. Then, the ceiling is taken care of. Only after that you will see the painter work on the walls. This is because of the fact that it is so much easier to tape off trims as opposed to taping off walls. Nobody wants to tape both the wall and the trim. 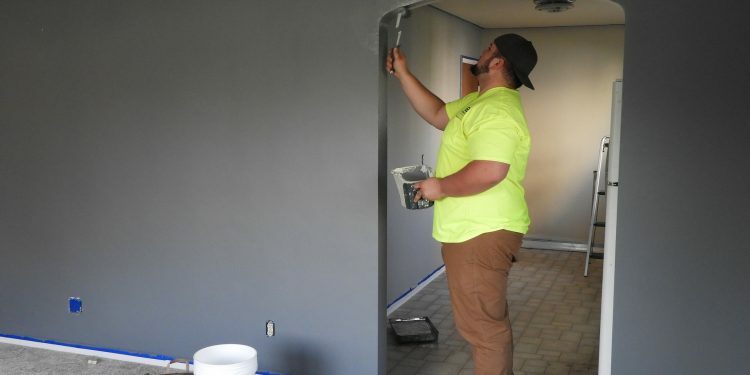 As the trim is painted, there is no need to worry about being neat. You just need a really smooth finish. If trim paint ends up getting on the wall, it does not matter as it can be covered up later as walls are painted. After trim is fully dry and painted, just tape it off, start painting the ceilings and move on to the walls.